I have always considered the bizarre-looking mantle clock in Scrooge’s bedchamber an important element of the setting, time being so integral to the storyline. But what do you do when that clock must display six different times within the course of a two hour and fifteen minute show and you can’t manually change the hands? That was the dilemma we faced when A Christmas Carol was refurbished in 2006. Since the original production opened in 1976, a volunteer stage hand had moved the hands to the appropriate time from behind the mantle wall. It was a simple, good old-fashioned, and most often, reliable way of doing it. With the 2006 re-design of the show, the Scrooge bedchamber wall was reconfigured to thunderously crack open for Jacob Marley’s haunting appearance. Not only did the wall part down the middle, but it also “flew” to a height of 35 feet above the stage, an elevation no one could possibly reach to change the clock times between bedchamber scenes. Since the re-design, we have had difficulty getting the clock to display the correct time for each segment in the story. To solve the problem, we called on former OCP technician, Bob Dewey, who specializes in computerized automation and has assisted us with motion control systems for moving scenery (and actors) on the Mainstage and in the Howard Drew Theatre. Dewey was asked to design and create an electronically generated mechanical module that would give us total remote control of the mantle clock. Criteria included: compact size to fit inside the existing clock, DMX (digital multiplex) controllable allowing us to program the clock in any direction and with variable speed, wireless preferred, affordable, and reliable without question. Four weeks after Dewey began the project; he returned with the prototype and after several trial setups, where electronic and mechanical bugs were worked out with our staff, we were presented with the solution to the clock dilemma. Using our console that controls all of the show’s lighting cues, we are now able to pre-program cues assigning the hands to read the exact time the scene requires. So through the magic of DMX we are able to set the clock for ten minutes to twelve, midnight for Marley, 1:00 am for Christmas Past, 2:00 am for Christmas Present, 3:00 am for Christmas Future and 6:25 am for Scrooge’s awakening on Christmas morning. This is probably not the most exciting thing we have accomplished recently, but sometimes I think it’s the little things that count. Next project: to re-design the clock face so it projects an eerie, ghostly glow as midnight strikes. Shortening the duration of the class session from eight weeks to six weeks. A number of classes will extend from 60 minutes to 75 minutes so that no teaching time will be lost. “Special Interest Sessions” – Two weeks prior to the start of each regular session, these workshops (two or three hours in length) will focus on specific topics such as stage combat, dialects, auditioning for musical theater, leaps and turns, hip-hop and assorted other dance or theater topics. The Winter Special Interest Session will start on Monday, January 12th and run through January 24th. The regular Winter Session will begin Monday, January 26th and conclude March 6th. Class brochures will be mailed and available for view online beginning November 15th. If you have ideas for class topics or feedback for the Education Department, please contact the Education Coordinator at 553-4890 ext. 131. The Ensemble- Samantha Brown, Nora Shelton, Samantha French, Debbie Massey, Joseph T. O'Connor, Jenny Priesman, Jared Walter, David James Zenchuck, Jr. The Cocoanuts is directed by Carl Beck. The show is stage managed by Mary Dew. Musical Director Jim Boggess shows Marcia Baer the new “Baer Pit” while son, John B. Baer looks on. On Thursday, September 11, 2008 the Omaha Community Playhouse held a dedication ceremony to celebrate the unveiling of a newly renovated Mainstage Orchestra Pit. The renovation was made possible through the generosity of the Alan and Marcia Baer Foundation and the Douglas County Commissioners Visitors Improvement Fund. 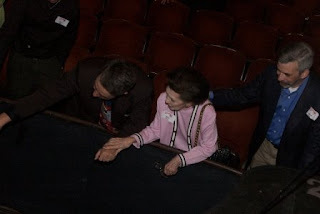 The Orchestra Pit was officially named “The Baer Pit.” The unveiling was attended by members of the Baer family, including Marcia Baer, and Douglas County Commissioner Pam Tusa with her spouse Gary Tusa. The dedication was followed by a party and preview performance of the Playhouse’s Mainstage season opener, The Cocoanuts. Many Omaha Community Playhouse “donors” and “friends of the Playhouse” were in attendance. 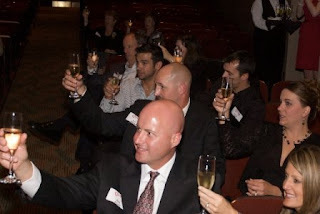 Ever wonder what is meant by “Producing Partner” during those curtain speech thank you's? Simply put, a “Producing Partner” is a show sponsor. These generous donors help defray some of the costs it takes to produce our shows. Their contributions help underwrite the costumes, scenery/sets, special effects and much, much more! Stones in His Pockets – Simmonds Restaurant Management, Inc.
Alright all of you high school and college students out there-- get ready for the opening weekend of The Cocoanuts September 12-14. You may purchase Lucky 7 tickets for any one of the four opening weekend performances for only $7! Just call the box office at 553-0800 to pay with a Visa or MasterCard or come by in person with check or cash. Request a Lucky 7 ticket and tell us where you are a student. When you pick up your ticket show us your student id. Where else can you see fabulous live theater for only $7?! Sorry, Lucky 7 tickets are for students only and are limited to one per student. Not a student but still want to see one of our productions for $7? On September 14, we will offer the first $7 Sunday Night tickets at the Playhouse. $7 Sunday Night tickets will only be sold for the Sunday night 6:30pm performance of each Mainstage production (does not include A Christmas Carol) during opening weekend. Tickets are available in person at the box office window starting at 4 p.m. on the day of the show. Cash and check are the only accepted forms of payment for $7 Sunday Night tickets. Seats are limited and are subject to availability. Sorry, no advanced reservations are accepted and this offer is not valid on previous purchases. Now there is no excuse for not visiting the largest community theater in the country and bringing a little culture into your life!